On a sunny Sunday afternoon in the Andalusian capital, the Benito Villamarin witnessed its second dramatic late goal in eight days. But, after Dani Ceballos came back to haunt his old club last weekend with Real Madrid, this time it was Betis’ turn to dish out some heartbreak. The home side had taken the lead in the 11th minute when Cristian Tello fired home a gorgeous free-kick just a few yards from where Ceballos had done the same the previous weekend. After coming from behind to eliminate Real Sociedad in midweek, it was the perfect start for the home side. However, Girona had gone unbeaten since December 16th and were level just after half hour. Under pressure on the touchline, Antonio Barragán under hit a back pass that was pounced upon by Seydou Doumbia. Doumbia had anticipated the pass, cleverly staying in an offside position waiting for the mistake. When the ball came his way, instead of rounding Betis keeper Pau Lopez, who had come out too late, he cooly squared it for Christian Portu who laid it off to Aleix Garcia. Lopez and three Betis defenders scrambled to defend their goal, but it was in vain as Garcia side footed around them. The Benito Villamarin fell into a rare moment of quiet as the Girona players celebrated. It fell into a deafening silence eight minutes later, as Girona went ahead and Portu and Doumbia were involved again. Pau Lopez also wanted in once more, and as Javi Garcia tracked Portu, who had made a smart run towards the by-line, Lopez rushed out when it really wasn’t needed. His attempt at snuffing out the danger took Garcia off the pitch, before retreating towards his goal after fumbling the ball to the feet of Portu. Portu looked up and crossed for Doumbia, who stooped bravely to nod home. It was Doumbia’s goal the previous Wednesday that knocked Atlético Madrid out of the Copa del Rey at the Wanda – a game Girona had been behind in twice – and it was his again that saw the Gironistes ahead at half time. Any thoughts of repeating their Copa heroics were in doubt just nine minutes into the second half. Sergio Canales broke down the left at speed, cutting inside and squaring to Loren, who drove the ball through the legs of Pere Pons and into the bottom corner. Canales had been brilliant all game, as he has been all week: two goals in his previous two games and assisting the equaliser in this game that was turning into a thriller, and a thriller that wasn’t done yet. It was the third of four added minutes where Canales, again, found space out left, much like he had all game. It was his hard work that had won the ball back for Betis in Girona’s half and, a couple of passes later, the ball was again at his feet on the left of Girona’s box. He whipped a low cross that Douglas Luiz struggled to dealth with. The 20-year-old Brazilian – on loan from Manchester City – then went to clear, but instead took out Giovani Lo Celso, who had nicked the ball from him just in time. The penalty was clear and the responsibility fell again to Canales, who slotted it home as the Villamarin erupted. Canales made his way over to the Betis bench, throwing his arms around Sidnei, who had learned that his father had passed away just before kick off. It was Betis’ first win of 2019 and a first defeat for Girona in over a month, one that saw them drop to 11th, just four points outside the relegation zone. In fact, so tight is the table, had Rayo Vallecano held on to win at home to Real Sociedad, they would now be just seven points behind Betis, despite starting the day in the bottom three. A wonderful strike from Santi Comesaña and a smart finish from Adrián Embarba, both inside the first half hour, had sent the home side well on the way to a fourth win on the bounce. 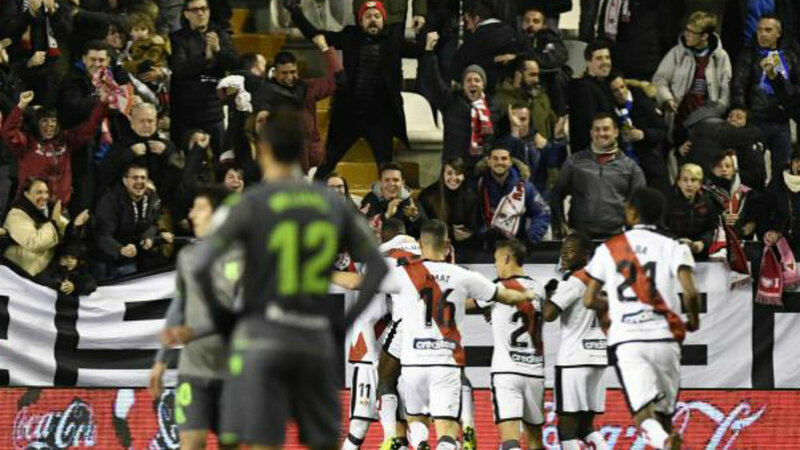 However, a Héctor Moreno goal before half time, and Willian José’s last equaliser, meant Rayo remained in the bottom three for now, despite being unbeaten since their visit to the Bernabéu in mid December. Rayo will undoubtedly be frustrated that they could not extend the gap to Villarreal as well as closing the gap to Athletic, who had drawn earlier in the day at El Madrigal. After a Jaume Costa own goal, the home side equalised through Karl Toko Ekambi with twenty minutes to go. They escaped a tight VAR call that ruled an Iñaki Williams goal offside just a few minutes later to secure a point, but leaves Villarreal without a league win since November. Athletic, on the other hand, remain unbeaten in the league under Gazka Garitano. Elsewhere… Marc-André Ter Stegen played his 100th league match for Barcelona as they beat Leganés 3-0 at Camp Nou. Casemeiro scored a brilliant goal and Luka Modrić got a second as Real Madrid beat Sevilla at the Bernabéu to move above them into third; a third defeat in a week for Sevilla. Getafe hammered Alavés 4-0 thanks to braces from Jaime Mata and Jorge Molina and are now just two points off the Champions League places. And finally, Jan Oblak secured his tenth clean sheet in twenty league games as Atlético Madrid beat bottom side Huesca 3-0 to stay five points behind Barça at the top.